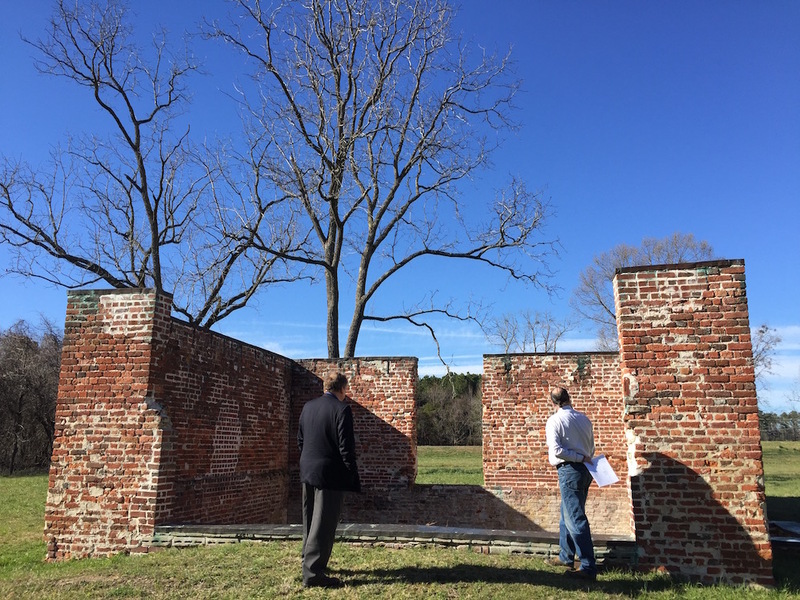 Three Associates journeyed to Williamsburg this week to investigate primary source documents relating to the Ludwell family and to introduce our project to officials of the National Park Service. Nicholas Chapman, our executive director, and Deacon Nicholas Dujmovic joined me on the visit to Virginia’s colonial capital. Our first visit was to the College of William & Mary’s Swem Library, where the courteous staff of the Special Collections Research Center, led by Director Jay Gaidmore, showed us eighteenth-century books and handwritten letters belonging to the Ludwell family. “Copy of my letter to the Govern’r (Spotswood)” – Philip Ludwell II, 1716. The year 1716 was a momentous year for the Ludwell family. To begin with, Philip Ludwell I, who had returned to England many years previously (and who inherited Green Spring Plantation in 1680 after marrying Governor William Berkeley’s widow Lady Frances Berkeley), passed away in London. He was buried in the Bow Church in Stratford, east London, where his grandson Philip Ludwell III and his great-granddaughter Hannah Ludwell Lee would also be buried, in the 1760s and 1780s. Meanwhile, back in Virginia, Philip Ludwell II, who was appointed Rector of the College of William & Mary in this same year, was involved in a dispute with Lt. Governor Alexander Spotswood over allegations that Ludwell had committed improprieties in his role of Auditor of Virginia. Ludwell family crest – wax seal on transatlantic correspondence from Philip Ludwell II to William Blathwayt in London. As we perused these letters, which included Ludwell’s correspondence with William Blathwayt, Auditor General of the Plantations in London, we noticed another extant wax seal bearing the Ludwell family crest, shown here. It should be noted that the three eagles on Philip Ludwell II’s 1716 seal are single-headed, whereas Philip Ludwell III later modified these to be double-headed eagles. Interestingly, students of early American history will note that Ludwell stated in his letter of “7br 10th 1716” that Spotswood was “gone to the mountains” – a reference to Spotswood’s leading the Knights of the Golden Horseshoe on the first official expedition over the Blue Ridge Mountains in August-September 1716. It was fascinating to read this letter, which was penned while this famous expedition was heading into the Shenandoah Valley for the first time. Near the end of the same year, Philip Ludwell III was born in Virginia on December 28/29, 1716. Inscription in Belles Lettres book given by Philip Ludwell III to daughter Hannah Ludwell (Lee). 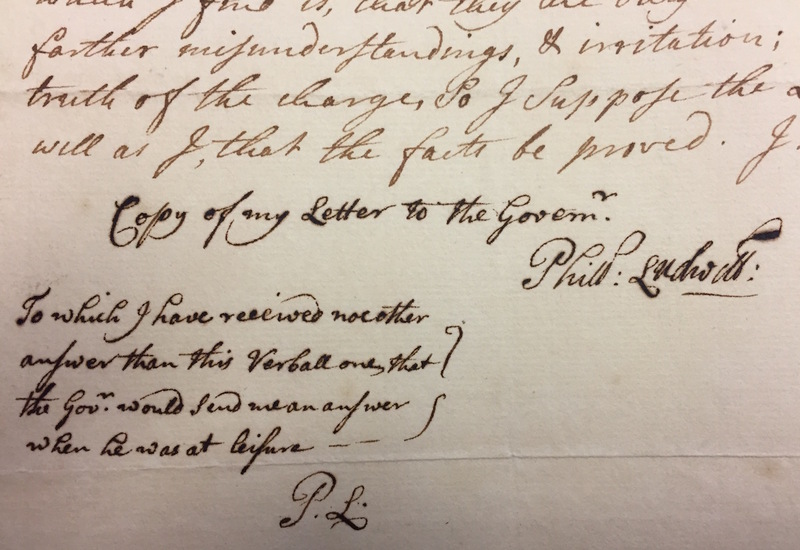 The Special Collections staff also showed us two sets of books that were owned by Philip Ludwell III and later given by him to his daughter Hannah Ludwell, who married her first cousin William Lee on March 7, 1769 in London. 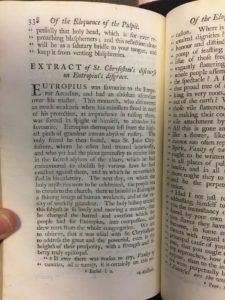 One volume of The Method of Teaching and Studying the Belles Lettres included sections such as “On the usefulness and necessity of studying the Greek Tongue” as well as references to Patristic writings. 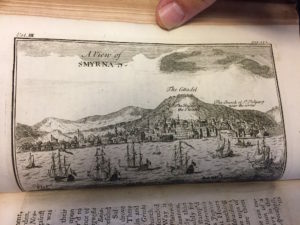 Another volume, titled A Voyage Into the Levant by M. Tournefort (of the Royal Academy of Sciences and Chief Botanist to the “Late French King”) and published in 1741, includes descriptions of Mount Athos and visual depictions of scenes that are familiar to most Eastern Christians – from Ephesus to Smyrna and beyond. 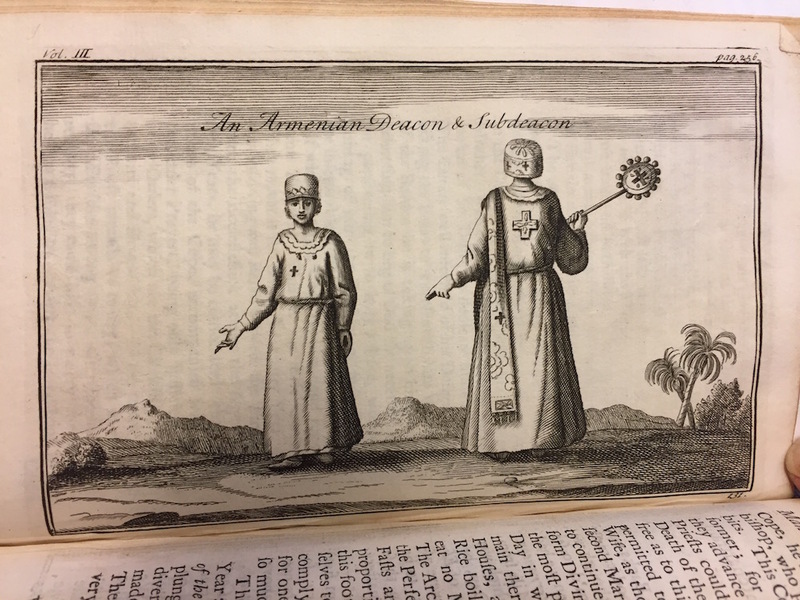 Displayed here, for example, is a drawing from the book of “An Armenian Deacon & Subdeacon,” showing that educated persons such as the Ludwells would have had some familiarity with Eastern Christian worship and practices. As noted throughout our website and blog, Philip Ludwell III translated Orthodox liturgical services and books on Orthodox religious practices. We also have documentary evidence about Ludwell’s conversion to Orthodoxy in London, his bringing his daughters to the faith in the same city more than twenty years later, and his desire to remain in sacramental communion with the Church while living in Virginia. Given this information, it would seem almost certain that Ludwell maintained some fidelity to Orthodox Christian beliefs and practices while living at Green Spring Plantation outside Williamsburg. 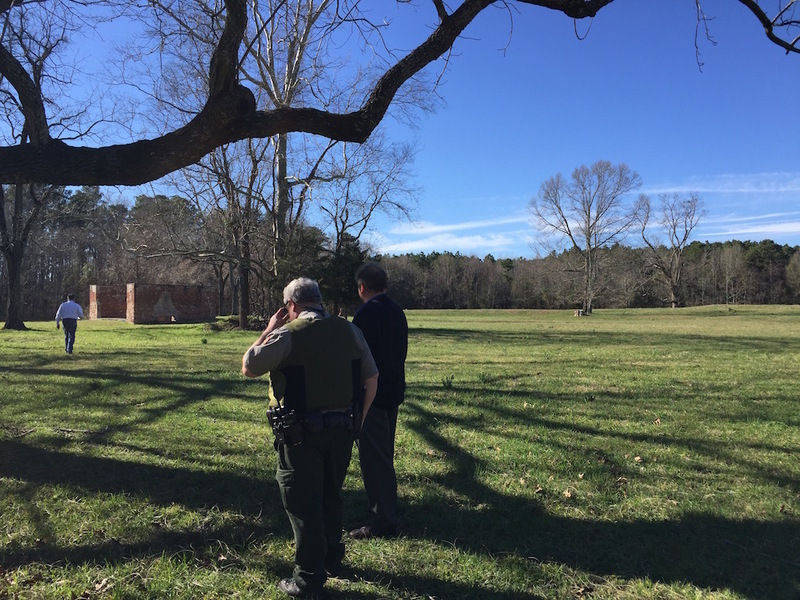 With much of colonial religious life based on plantations, we believe that the archaeological structure labeled “S” on the 1950s excavation map may be the first Orthodox chapel in America. Nicholas Chapman and Dcn. Nicholas Dujmovic at the only extant above-ground structure at Green Spring plantation, which approximates the size of Structure S.
We were fortunate to have the opportunity to discuss Philip Ludwell’s life and possible religious activity at Green Spring with two officials of the National Park Service’s Colonial National Historic Park, which maintains Green Spring, Yorktown Battlefield, and Historic Jamestowne. As we have written about elsewhere, we expressed to them our interest in seeing a more vibrant interpretation and exposition of Green Spring’s history, which for now lies quietly under fields of grass, with springtime daffodils rising from the ground. 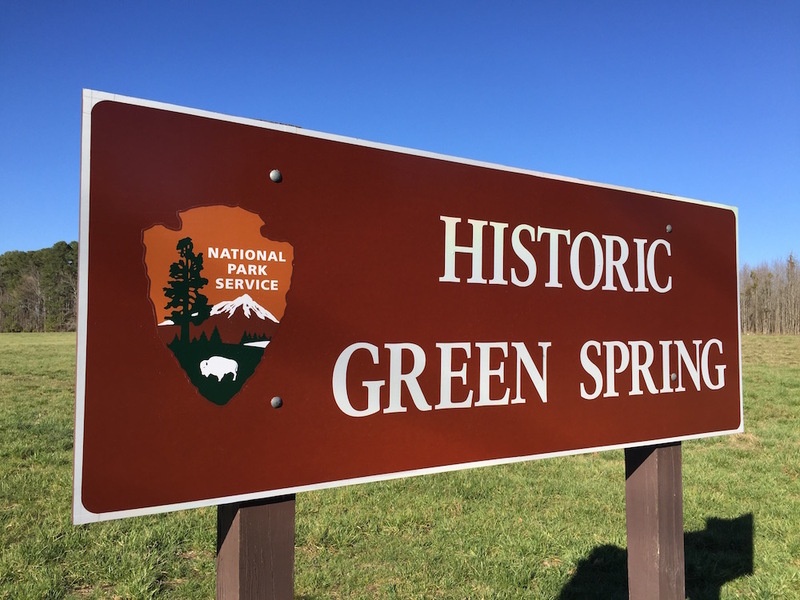 Many crates of artifacts from the 1950s Green Spring archaeological excavations remain unexamined on National Park Service property in Jamestown, a couple miles south of Green Spring. 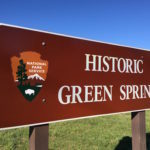 The Park Service performs exemplary work in maintaining, researching, and interpreting the sites under its protection, and we expressed our desire to assist them in determining whether any clues to 1700s Eastern Christian worship at Green Spring can be found amidst the excavation artifacts. 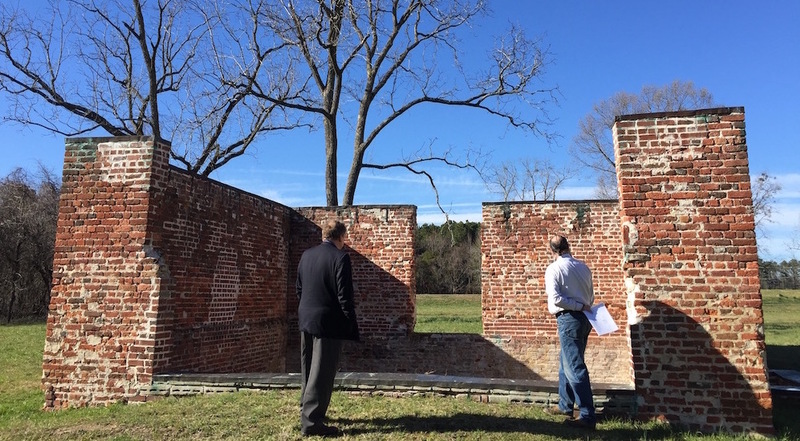 Nicholas Chapman standing with a Park Service officer at the location of Structure S, possibly the first Orthodox chapel in America. I am fascinated with this information. I was born in the USA and followed the Baptist faith until my early 40’s. I studied orthodoxy and converted thereafter, and currently live for Jesus, through my Orthodox faith. This is quite interesting! I grew up near Williamsburg and visited it often. What a great excuse to go back! I hope you’re able to investigate this more. Although an “s” in colonial handwriting sometimes was written like an “f”, I don’t believe the actual spelling was changed. So, for instance, “myferies” in the article, should be “mysteries” and “compaffion” should be “compassion”, among others. Look at the Declaration of Independence. It’s looks like “pursuit of happinefs” but we all know it is “pursuit of happiness”. Interesting article! Thanks for posting. One small orthographical point: the so-called ‘long s’ – ſ – is not the letter f but a form of the letter s. So “the holy myſteries” is not “the holy myfteries” but “the holy mysteries”; “Chryſoſtom” is not “Chryfoftom” but “Chrysostom,” and so forth. God Bless You, Mary. Orthodoxy is proud to count you among their number. During this period in history, the young men of British aristocracy made their grand tours of classical Greece and Rome. Greece, especially its islands, would have included numerous and ancient monasteries, Saints tombs and relics. Part of a young gentleman’s education would also have included instruction in the Classical Greek language. Therefore, it would not surprise me if there were more than the Ludwell family who may have been drawn in by the 2000-year-old Orthodox faith. 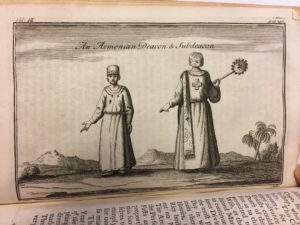 Such converts may not have found a Christian home in Protestant England, but in colonial America, those of different faiths were drawn by its policy of religious freedom of worship. Exciting! It is very interesting article about the presence of holy orthodoxy in the colonial America. May we all, through the intercession of the most pure Mother of God Theotokos, be illumined by the grace of Holy Spirit to serve our Heavenly Father and the Church of His only begotten Son and our Lord Jesus Christ. Please pray for my poor soul and patience! the crest is not apparent in the seal, which bears only the registered cost of arms of the individual. Families as such do not own the right to any arms, but members of a family may obtain individual rights to bear them. As you point out, the son of a man bearing registered arms (an ‘armigerous gentleman’) differentiates his own arms by altering one or more features of his father’s arms so that the result bears a genetic resemblance yet is distinguished as his own apart from his father’s. These are some rules of arms regulated by the Royal College of Arms. Crests, optional elaborations surmounting the coat of arms, are another matter beyond the design in the shield, governed by further rules of the College.